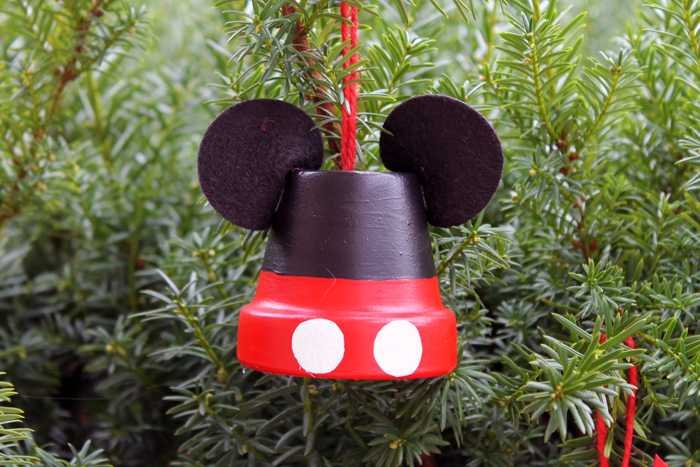 You can make these Disney inspired ornaments for your tree this holiday season. 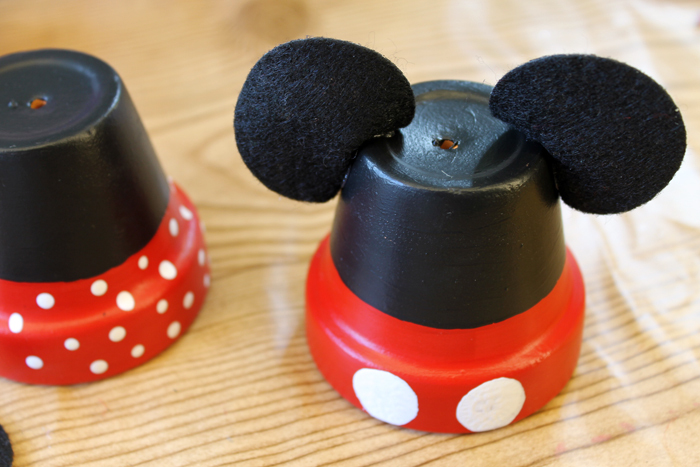 If your kids love Mickey and Minnie, they will love helping to paint these terra cotta pots and make ornaments like their favorite characters. Add a few of these to your tree this Christmas! 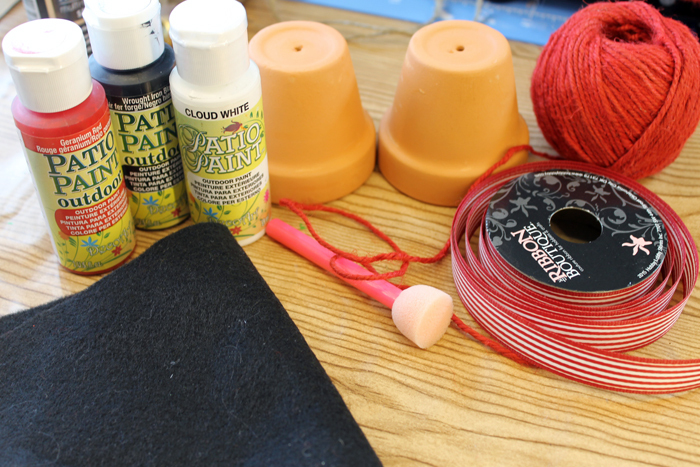 Start by painting your terra cotta pots. Paint the bottom portion red. 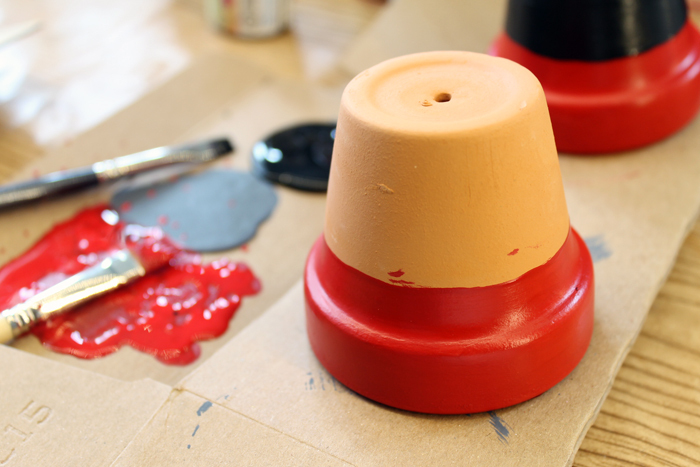 Allow the red to dry then paint the top portion black. Allow to dry completely before continuing. NOTE: Patio Paint usually covers in one coat but multiple coats may be needed if using another paint. Add white dots with paint as shown below. 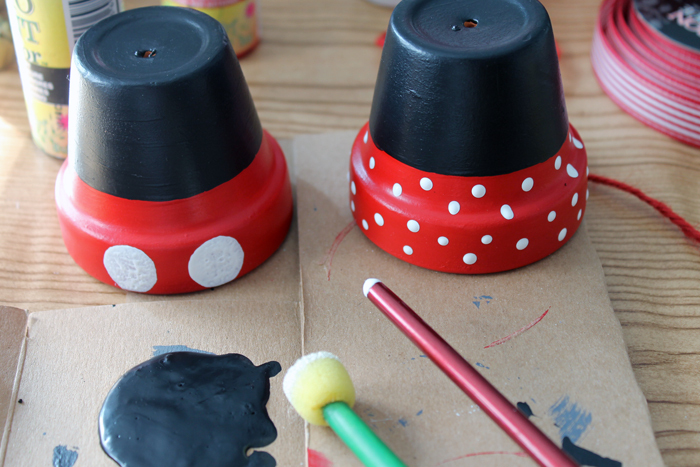 I used the round sponge brush for Mickey and the wrong end of the paint brush for Minnie. While the dots dry, you can make your ears. 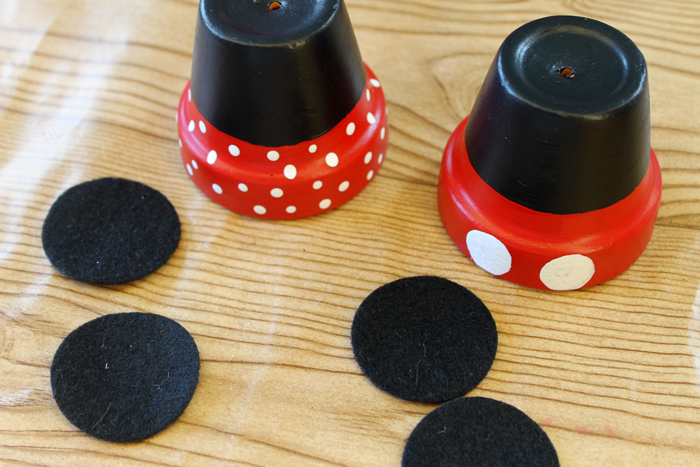 Cut round circles from the black felt. Use hot glue to secure to the top of the pot as shown below. 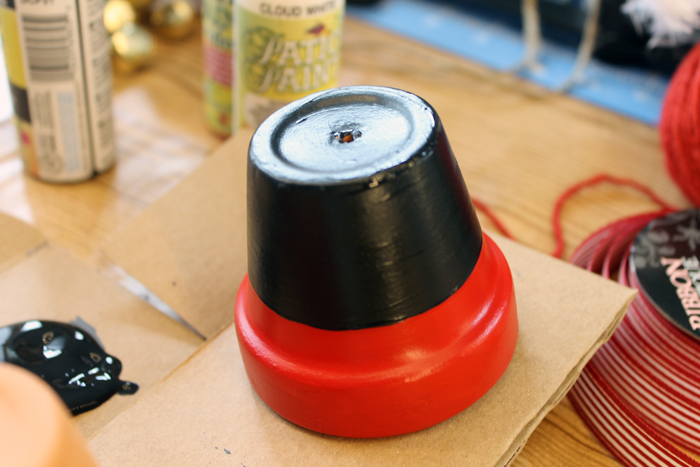 Once dry, add red twine to hang your ornament through the hole in the bottom of the terra cotta pot. Knot the end as shown. Minnie gets a pretty bow on top that is secured with hot glue. 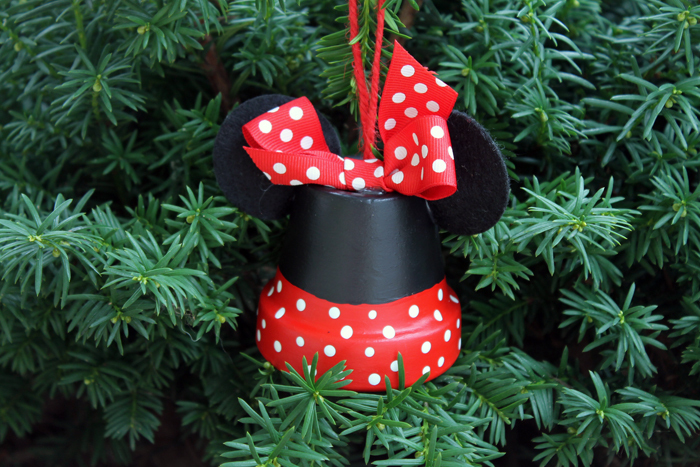 These Disney inspired ornaments are ready to hang on your Christmas tree. 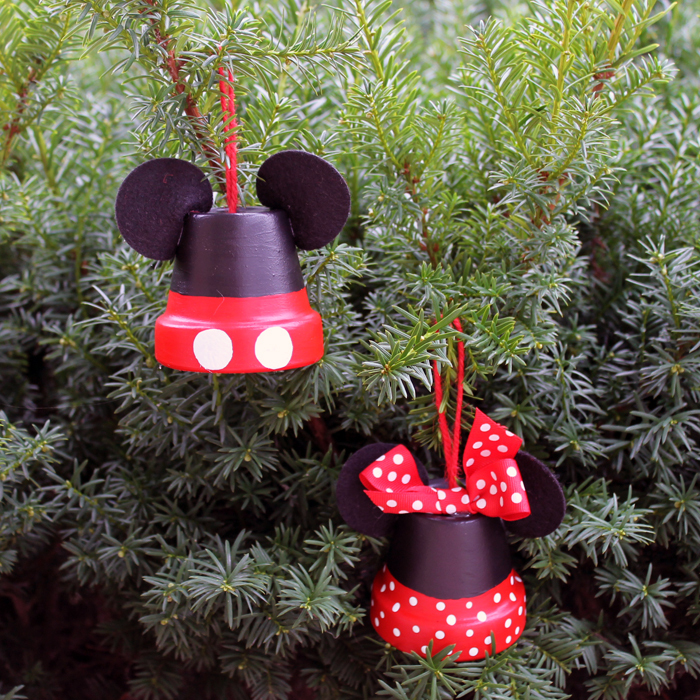 Your kids will love Mickey and Minnie hanging from the tree. Let them help with the painting of these easy to make holiday ornaments. 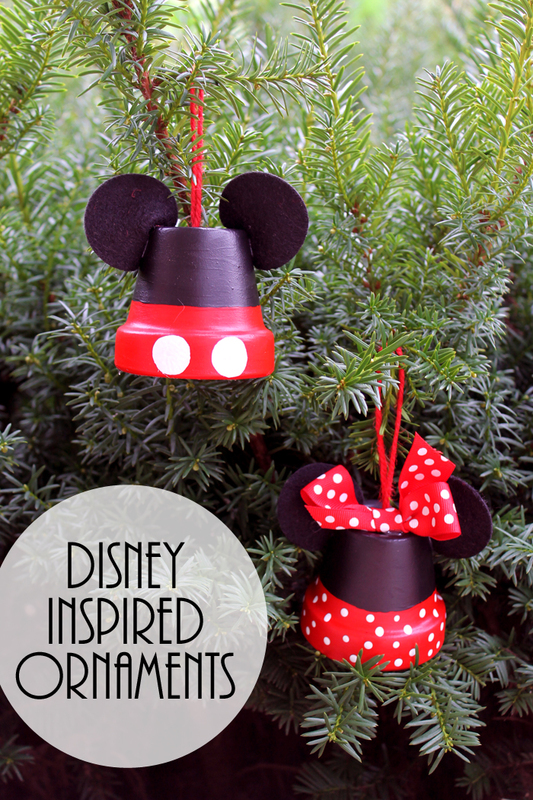 Make these Disney inspired ornaments for your tree or to give as gifts. 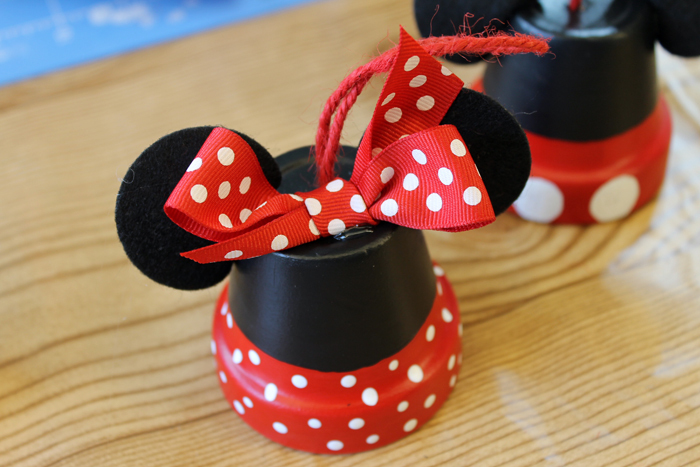 You will love how easy Mickey and Minnie are to make for your Christmas tree! Love this and want more? 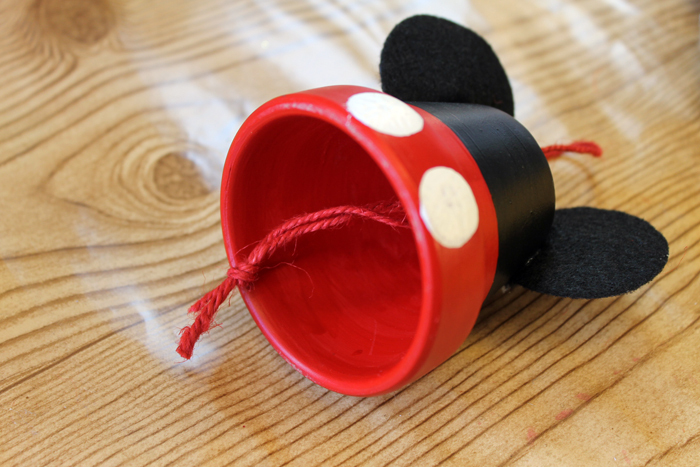 Get 16 more Disney Christmas ideas here. How cute – very creative! So adorable. I love crafting with clay pots. These are so stinkin’ adorable. I have a friend who lives for visiting Disney World. I’ll be making a set of ornaments for her as a gift. Congrats, you’re featured this week at the #ThisIsHowWeRoll Link Party. These are just darling! Pinning for our next Christmas crafting day! Thank you for sharing your post on the Simple Sweet Homemade Linky Party. You were my choice for this week’s Friday Feature. I will be featuring this great post and doing this with my girls next week. Merry Christmas!! Oh my goodness! These are perfect for my children’s Christmas tree. Thanks so much for the inspiration! arent the pots to heavy to hang on the tree though? They were not bad at all actually. I have seen way heavier ornaments! There are tiny little pots at Michaels.